There are unlimited bathing suit styles to choose from, especially for women. This can often make choosing difficult when you’re flooded by different options. The most important thing to consider when looking for a new swimsuit is what you feel most comfortable in. For this blog, we’re just going to focus on the Boy Shorts styles for women and take a look at some of the pros and cons. There are countless pros to the boy shorts swimming suit style. The first is they cover more than most bathing suits and bikinis do. This is a huge plus for many because let’s face it, most of us don’t love putting on bathing suits. And when you do, you want to feel comfortable so you can relax and have fun! Chances are you won’t be able to do that if you feel self conscious. They are also more practical than a standard bikini. They are much longer so you don’t necessarily need a swimsuit cover up. If you’re at the beach, you can just throw on a tank and you’re ready to go! There are some cons that come along with the boy shorts. One is that they will leave you with some not-so-great tan lines. If you’re trying to get that bronze, full body, “summer tan” look, then boy shorts are not the way to go. Another con of the boy shorts is that they tend to bunch up, making it very uncomfortable and awkward looking. And if they stretch a bit, they get really loose in the water. If you are jumping into a pool or lake or wherever, you have to be extra aware of your swimsuit bottoms as you’re diving into the water. What Makes You Most Comfortable? When it comes down to it, you should choose whatever swimsuit style you feel most comfortable in. There are pros and cons to every bathing suit style, not just the boy short. No matter what style you choose, do not forget to grab your #1 swimming accessory as you head out to the beach, lake or pool. 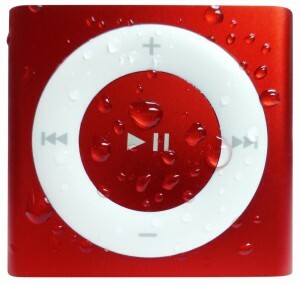 I’m talking about the Underwater Audio waterproof iPod of course! You can shop for your favorite style right here! What is your favorite bathing suit style? What do you look for when buying a new swimsuit?